LEWISTON (Scrap Monster): Portland is all set to become the first city in Maine to implement ‘green packaging’ policies. Starting April 15th, the city will impose a fee on disposable plastic and paper bags at grocery. In addition, the city will also ban the use of polystyrene food and beverage containers by businesses. The retailers will charge 5-cent fee on disposable plastic and paper bags given out at grocery and convenience stores, pharmacies and farmers markets. The smaller bags distributed in produce sections will not carry a fee. The amended city Code allows retailers to keep the money. The stores and restaurants will have to use alternatives to pack meat products. They will also stop selling polystyrene foam products such as disposable plates and cups. However, products that reach the stores in foam packaging will not be affected by the ban. Packaging of seafood is also exempted from the ban. According to the City, the ban will enhance its appearance and protect the health of its environment. Last week, the city had sent letter to nearly 500 businesses to remind them about the upcoming changes. It had also offered necessary assistance to owners to help them in their transition to the new system. The city ordinances are intended to control waste generation, reduce litter and promote use of recyclable packaging, it stated. Portland had approved the ordinances based on a year-long study conducted under the leadership of Councilor Ed Suslovic. In the run up to the proposed ban, retailers have launched customer awareness campaigns at their outlets. 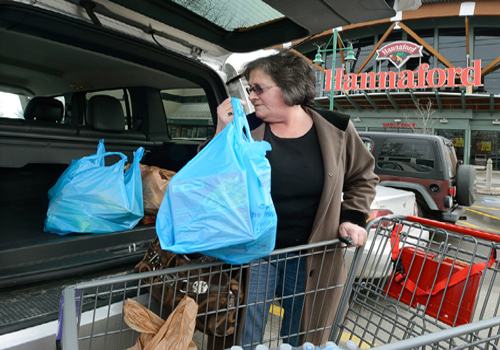 For instance, Hannaford expects to give out nearly 100,000 bags free of cost. The retailer also announced that the bag fees collected at its Portland stores will be donated to hunger relief.